Feeling lucky? We are giving you money to enter the Seminole Hard Rock Poker Open. Giveaway opportunity is for 2 $575 Buy-In certificate for the satellite event. The Seminole Hard Poker Open runs from August 8th-29th and the $10,000,000 guarantee Championship Event starts on August 22nd. The first place winner alone will receive over $1.5 million in prize money. Plus, the 33-event series will have additional payouts beyond the $10 million. Follow the instructions in the giveaway box by login into your Facebook account or as prompted. To increase your chances, you can log in everyday to tweet the giveaway. When you are done, share with your friends. 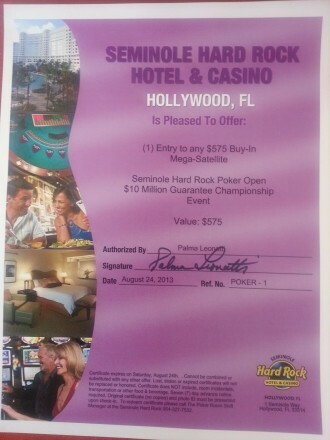 All giveaways are handled by Seminole Hard Rock Hollywood. Once a winner is selected, details to claim your prize will be provided. Winner has up to 2 hours to respond to the email. If no response is received, we will move on to the next contestant. Please be reminded you must be 21 years old to enter. No purchase necessary for this giveaway. The giveaway is open nationwide, and eligibility is at the discretion of Premier Guide Miami. One (1) winner will be chosen at random on August 16th, at 4 p.m. EST. Dates, times, and other contest specifications are subject to change at any time. Premier Guide Miami reserves the right to alter or cancel the contest for any reason at any time. Giveaway ends on August 16, 2013 at 4pm. Contest is sponsored by Seminole Hard Rock Hollywood.